Home » Distilled Internet » 12 Worst Things in the Star Wars E.U. If this statement is not agreed upon, you should probably leave and never come back. The full article is well worth the read, and may even make you appreciate Star Wars even more than you already do. He fell in again. We all know Fett’s better than that. There’s centaurs in this book. Horse people, ruining the world again. A droid that uses the force. Come now…. Space whales, which should be cool, but are far from it. Please keep banking and weapon-free planets out of Star Wars. It’s just depressing. An awkwardly named Tusken Raider. That is all you need. Before Clone Wars came out, cloning was an interesting topic. This was not one of them. Jabba has a gay uncle. Funny yet terrible. Invincible star system destroying ship that no one knows about. Stolen by a kid. Sounds almost OK. But not really. Hutts don’t get to be Jedi! 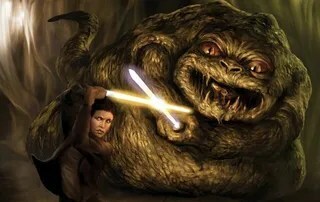 Who gives an overweight slug a lightsaber in the first place? It’s the muppets mash-up with Star Wars no one asked for. A good way to solidify that emotional mountains will always be dicks (looking at you, Adventure Time).